Loveseats are versatile and functional because they are larger than chairs, yet smaller than couches. These pieces are great for families who need additional seating, couples who like to snuggle, or singles who like to sprawl out. Loveseats are a great alternative to sofas for small or oddly shaped rooms. Before buying your loveseat, measure your living room and create a furniture plan. Include tables in your measurements and consider line-of-sight for television viewing. As families tend to gather in the living room, it is important to leave ample space for activities, like game or movie nights. If you plan on using your loveseat as the only couch in the room, it will get a lot of use; set aside a larger budget for this piece. A good quality, well-maintained loveseat will last for many years. While bargain pieces will be cheaper, you will have to replace them sooner. If you plan on using your loveseat to supplement your couch, it is likely to get much less use and a smaller budget might suffice. Traditional loveseats fit well in formal settings. These pieces tend to be more decorative with classic lines or printed fabric. Modern or contemporary loveseats are characterized by clean geometric lines and sleek materials. They are often lower to the ground with squat backs. Contemporary pieces are more versatile as they have less embellishments. Since loveseats are smaller pieces, you can pick one with a bold color or fun pattern to update the room without overwhelming the eye. For areas where people often gather, like living rooms, adding red or yellow loveseats will create a positive vibe. Darker, subdued hues, such as blue, green, or brown, are better suited for places associated with rest, such as sitting rooms. 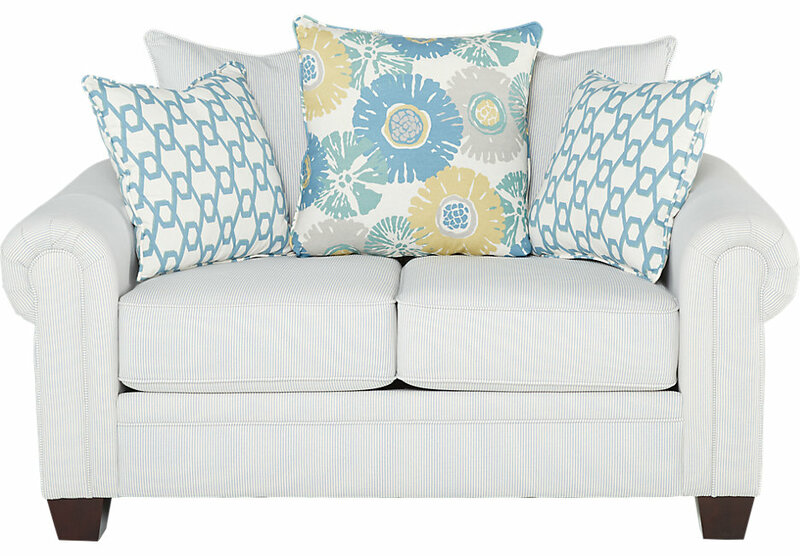 Choosing a loveseat that highlights an accent color will bring any room together. Loveseats are generally upholstered with leather or fabric. Leather is always a great option, as it's durable, easily cleaned, and fits well into both contemporary and traditionally decorated spaces. If you are going for a more playful look, printed fabric works great. For family seating, consider plush, stain-resistant materials such as microfiber.